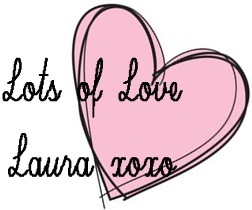 You can now follow the What Laura Loves blog on Facebook by going to www.facebook.com/whatlauraloves and clicking the ‘Like’ button. Ive set it up as another way for you to get the links to my blog posts. I know some people follow many many people on Blogger and its hard to keep a track of all the new posts on the dashboard so if you ‘Like’ me on Facebook then you can see the links to just my blog posts on there and if one takes your fancy, give it a click and it will take you straight here!